With all the buzz surrounding the Julie & Julia movie, you probably already know the basic premise: Julie Powell, stuck in a dead-end job and approaching thirty, decides to spend a year cooking all 524 recipes in Julia Child’s Mastering the Art of French Cooking. Powell, who describes her secretarial job at a government agency as soul-sucking, thought cooking Julia Child’s recipes would be a great way to learn to cook and, at the same time, reclaim her life. She began blogging about her experiences in the kitchen and eventually landed a book deal (if you are curious about her blog it is still available here). If this sounds like the undertaking of a pretentious New York foodie, think again. Julie Powell is not some Martha Stewart wannabe – she’s a foul-mouthed former Texan who lives in a decrepit Queens apartment and has a bit of an obsession with Buffy the Vampire Slayer. The book is full of horrifying descriptions of her apartment and lack of basic hygiene, from backed up pipes to maggots – be prepared to be completely grossed out. Her cooking experiences rarely go smoothly and the labor-intensive recipes mean that she and her husband hardly ever eat dinner before 10 pm. If you’ve seen the movie (or even the paperback cover which has Amy Adams wearing lace and pearls) you may have a slightly different image of Powell. As she says in this interview, the movie portrayed her as a “softer” version of herself and cleaned up her language. Even more horrifying than her apartment are some of the dishes she has to prepare. Liver, kidneys, brains, marrowbones, these are just some of the ingredients called for in Mastering the Art of French Cooking. Child’s chapter on aspics seems particularly unappetizing and contains such recipes as “Foies de Volailles en Aspic” which is basically “chicken livers cold with jelly on top of them.” The jelly, by the way, is made by boiling calves feet, the thought of which just makes me shudder. As you can probably imagine, preparing all this French food required lots and lots of butter. Powell estimates that she used 60 lbs. of butter that year (how do the French stay so thin?). Despite the fact that this book occasionally made me nauseous, I really enjoyed reading about Powell’s life and experiences in the kitchen. I think she has a great sense of humor and her struggle to get her life on track is relatable. Julie and Julia reminded me of Bridget Jones’ Diary because it’s also about a twenty-something who doesn’t have it all together, and who somehow manages to be self-absorbed and endearing at the same time. If you are a serious Julia Child fan and are looking for recipes or detailed information on preparing her dishes, this probably isn’t the book for you. 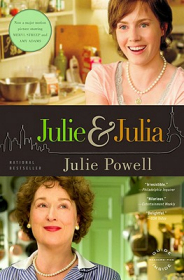 But if you are looking for a hilarious and snarky story about a young woman changing her life, give Julie and Julia a try. Buy Julie and Julia: My Year of Cooking Dangerously by Julie Powell on Amazon by clicking here .